Baton Rouge, LA- The Southern University Ag Center in partnership with the Outstanding Mature Girlz (O.M.G.) Organization will host the 2015 Outstanding Mature Girlz Youth Conference for young ladies ages 10 and up. The conference, which is being held in honor of National Women and Girls HIV/AIDS Awareness Day, will take place on Saturday, May 30 from 9:30 a.m. to 3 p.m. on the campus of Southern University in the Cotillion Ballroom of the Smith-Brown Student Union. Registration will begin at 8 a.m. The O.M.G Youth Conference will feature fun, yet informative breakout sessions, fascinating guest speakers, live entertainment, and tons of surprises! Free HIV testing will also be available on site. 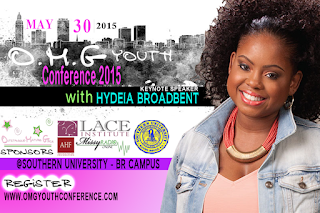 International HIV/AIDS Activist Hydeia Broadbent will be the featured keynote speaker. She has been featured in prominent publications such as: The New York Times, People, Teen People, Essence, Ebony and Sister 2 Sister Magazine. Broadbent has also taken part in many of America’s talk radio programs including: The Michael Eric Dyson Show, Russ Parr Morning Show, and The Tom Joyner Morning Show. Broadbent also has served as a speaker and guest panelist at many of America’s most respected educational institutions including Duke University, Spelman, UCLA, USC, and Howard University. Broadbent was named one of the Most Influential 150 African Americans in 2008 and 2011 by Ebony Magazine and has received both the American Red Cross Spirit Award and an Essence Award. Now at age 30, she spends her time promoting HIV/AIDS awareness and prevention. “...with all that we know about the virus, it is clear to me that contracting HIV/AIDS today is a choice and we can’t allow anyone the power to make that choice for us!,” said Broadbent. All girls aged 10 and up can register for this free event online at www.omgyouthconference.com. Lunch will be provided. www.omgyouthconference.com and clicking on “donate” at the bottom of the page. Other community partners include the Southern University Division of Student Affairs, L.A.C.E Institute, AmeriHealth Caritas Louisiana, Dr. Tom Rathmann, Clay Young Enterprises, Atty. 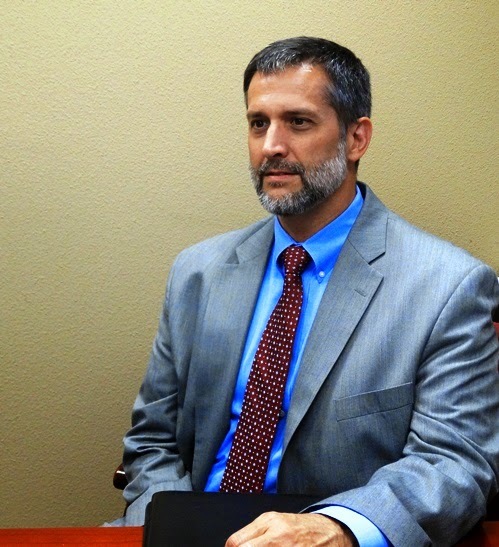 Marty Maley, AIDS Healthcare Foundation, and the Baton Rouge community. attendance. Schools, youth groups, and parents are encouraged to have their young ladies registered prior to the event. For more information, contact Sashika Baunchand via e-mail at info@omgyouthconference.com or Nicolette Gordon via e-mail at nicolette_gordon@suagcenter.com or simply log onto www.omgyouthconference.com. Baton Rouge, La - With pastures so wet and grass a little short early in the growing season, producers should be watching for signs of liver fluke infections, said David Fernandez, Cooperative Extension Program livestock specialist at the University of Arkansas at Pine Bluff. While rarely fatal in cattle, flukes can cause death in small ruminants such as goat and sheep. Liver flukes reduce the value of a carcass thus lowering prices producers receive, he added. Liver flukes are flatworms that invade the liver of livestock and cause liver damage. Liver flukes have a two-host life cycle. The eggs only hatch in water, so in wet years like this one, there are more problems with flukes, Fernandez said. The larvae infect a snail where they develop and reproduce asexually. The larvae then exit the snail and encyst on nearby vegetation. When livestock eat the vegetation, they become infected. · Mow pastures to remove cysts as encysted fluke larvae can remain viable for months if they do not dry out. Treatment options include: clorsulon, found in Ivomec Plus dewormer, and albendazole (Valbazen) in the United States. Treat animals before the rainy seasons begin, such as fall or late spring in Arkansas. This can help reduce the number of eggs laid on pastures and reduce the chance of infection, said Dr. Fernandez. Be sure to follow label instructions as Valbazen should not be given to pregnant animals. Neither Valbazen nor Ivomec Plus is labeled for use in lactating animals. Both have long withdrawal periods before slaughter. For full detail, visit the Cattle Network online. Liver fluke is caused by a parasite Fasciloa hepatica. Diagnosis of liver fluke is often confused with other conditions such as poor nutrition. According to the Cattle Site, All grazing cattle are susceptible to liver fluke, although wet areas hold higher risk. Common symptoms include: condemnation of livers; reduced live weight gains through reduced feed conversion efficiency; reduced milk yield; reduced fertility; anemia; and diarrhea. Liver fluke is not infectious. SU Ag Center Vice Chancellor's Drs. Adell Brown and Gina Eubanks speak to members of the Louisiana Senate Committee on Agriculture, Forestry, Aquaculture and Rural Development on May 26 at the Louisiana State Capitol. 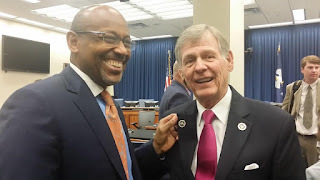 Dr. Adell Brown pins an 1890 lapel pin to the jacket of Senator Francis C. Thompson, Chairman of the Senate Committee on Agriculture, Forestry, Aquaculture and Rural Development. 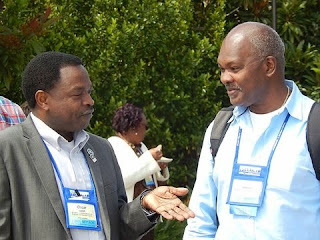 Baton Rouge, LA- Southern University Ag Center Vice Chancellors Drs. Gina Eubanks and Adell Brown made a presentation on the accomplishments of the SU Ag Center and the Center's celebration of the 125th Anniversary of the signing of the Second Morrill Act of 1890. 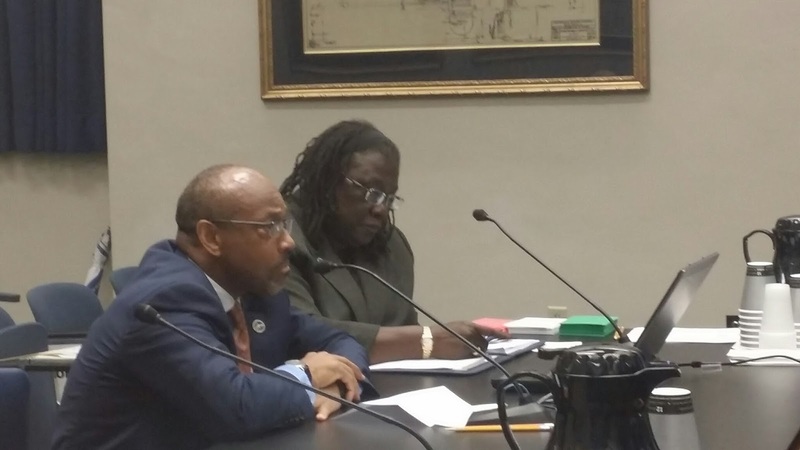 The presentation was made on May 26 during the Louisiana Senate Committee on Agriculture, Forestry, Aquaculture and Rural Development’s meeting at the Louisiana State Capitol. 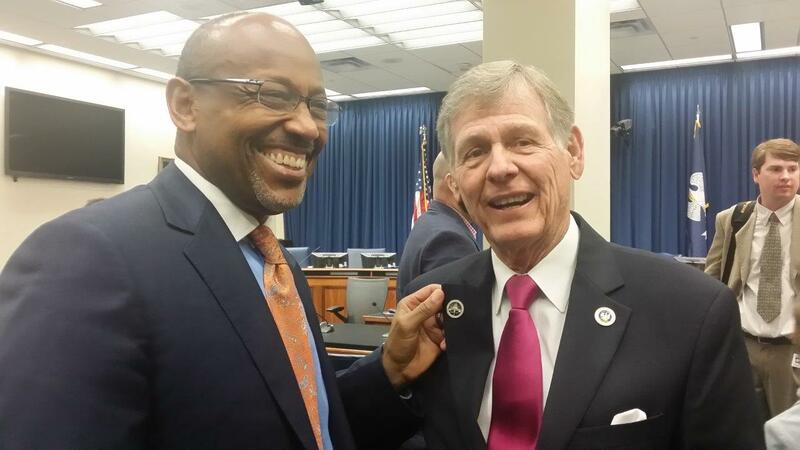 After the meeting, Dr. Brown pinned an 1890 lapel pin to the jacket of the committee’s chairman, Senator Francis C. Thompson. Today the institutions, more commonly known as 1890 Land-Grand Universities, continue to lead the collaborative vision of a better world while addressing today’s challenges and focusing on providing lifelong learning opportunities for all. For a complete listing of scheduled events for the 1890 year-long celebration, visit http://www.suagcenter.com/PageDisplay.asp?p1=2251. 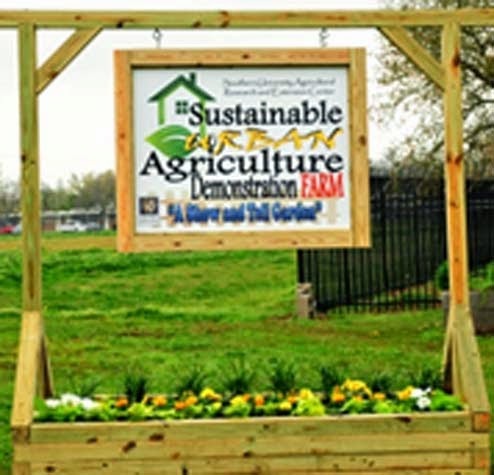 Baton Rouge, La - The Southern University Ag Center’s Sustainable Urban Agriculture Demonstration Farm has launched its farm tours. The show-and-tell garden is for everyone. This educational garden gives information on vegetable varieties, planting instruction, composting techniques, and other relevant information. The farm tours will be available throughout the year. To schedule a tour, please contact Dawn Mellion-Patin or Zanetta Augustine at the SU Ag Center by calling 225-771-2242. Baton Rouge, La. 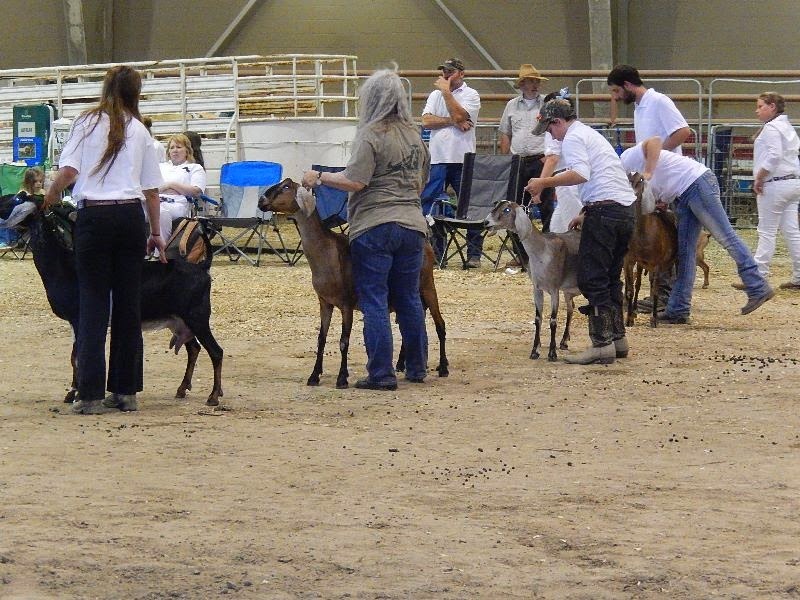 – The Southern University Ag Center hosted the Delta Dairy Goat Show Friday, May 22 - Sunday May 24, 2015 at the Maurice Edmond Arena. The event was sponsored by Delta Dairy Goat Association and the SU Ag Center, and consisted of four open junior doe shows, four open senior doe shows, and four open buck shows sanctioned by the American Dairy Goat Association. Participants came from Louisiana and surrounding states as far as Arkansas and Mississippi. One of the avid contestants participating in the weekend event was Skylar Noblin; a 7th grader from Edwards in Hinds County, Mississippi, a veteran who showed in the junior and senior doe categories, and a winner of past grand championships. 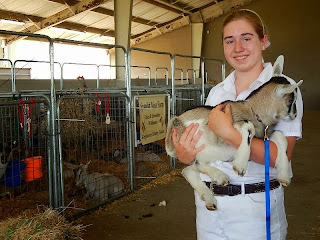 Visit the Delta Dairy Goat Association’s website for more detail. 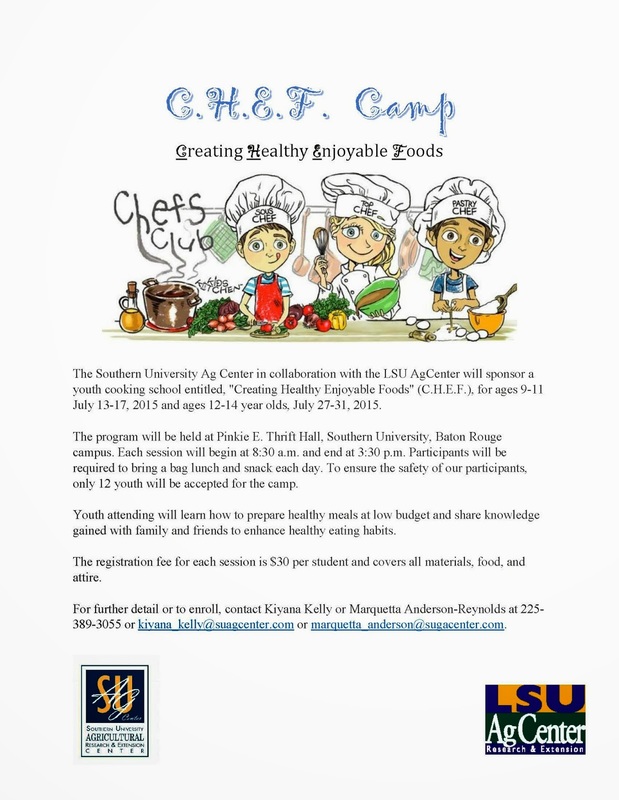 Baton Rouge, LA- The SU Ag Center, in collaboration with the LSU AgCenter, will sponsor a youth cooking school entitled, “Creating Healthy Enjoyable Foods” (C.H.E.F. 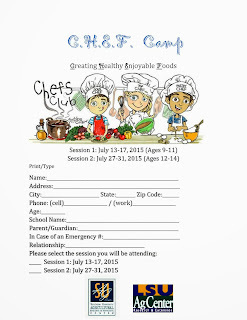 ), for youth ages 9-11 on July 13-17 and ages 12-14 on July 27-31. Both sessions will be held on the Southern University Baton Rouge campus in Pinkie E. Thrift Hall from 8:30 a.m. – 3:30 p.m. To ensure the safety of all participants, only 12 youth will be accepted per session. Participants are required to bring a bag lunch and snack each day. To register for the camps, parents must submit a completed register form with the $30 registration fee. This fee, which must be paid in the form of a money order, includes all materials, food and attire needed for the camp. Money orders should be made payable to the Southern University Ag Center and mailed to: C.H.E.F., Nutrition Education Program, Southern University Ag Center, P. O. Box 10010, Baton Rouge, LA 70813. For additional information or to obtain a registration form, contact Kiyana Kelly or Marquetta Anderson-Reynolds at 225.389.3055 or via e-mail at, kiyana_kelly@suagcenter.com or marquetta_anderson@suagcenter.com. Baton Rouge, La. Dawn Mellion-Patin, Ph.D., Extension Specialist, Agriculture, submitted a 30-minute presentation titled “Wisteria Alliance,” which was accepted for presentation at the 2015 Extension Risk Management Education National Conference in Minneapolis, MN from April 29 - 30, 2015. 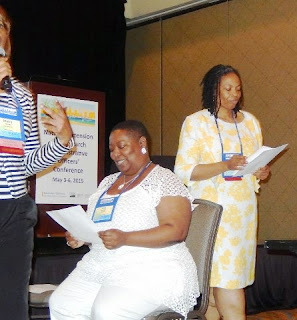 Her presentation was included in the conference proceedings, available at http://agrisk.umn.edu after the conference. 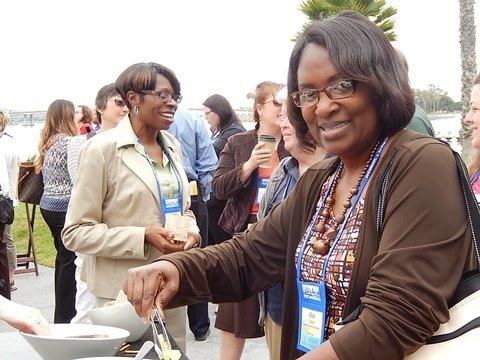 The Extension Risk Management Education National Conference brings together private and public sector educators, crop insurance agents, lenders, and other agricultural professionals. The biennial conference allows this diverse group to share ongoing and emerging successful risk management education efforts which target agricultural producers and their families. Conference participants learn about what is working to help producers effectively manage the following types of risks associated with their agribusinesses: Production, Price or Market, Financial, Legal/Institutional, and Human Risk. The Wisteria Alliance is a relatively new training series offered by the Southern University Ag Center, with the goal of providing practical, hands-on activities for women who live on farms, those interested in starting a farm, and /or urban / community gardeners. All of the trainings are designed for women, and are primarily conducted by women. During the training sessions, facilitators strive to create an atmosphere where women are comfortable asking questions, and learning different tasks normally reserved for men, in a warm nurturing environment. 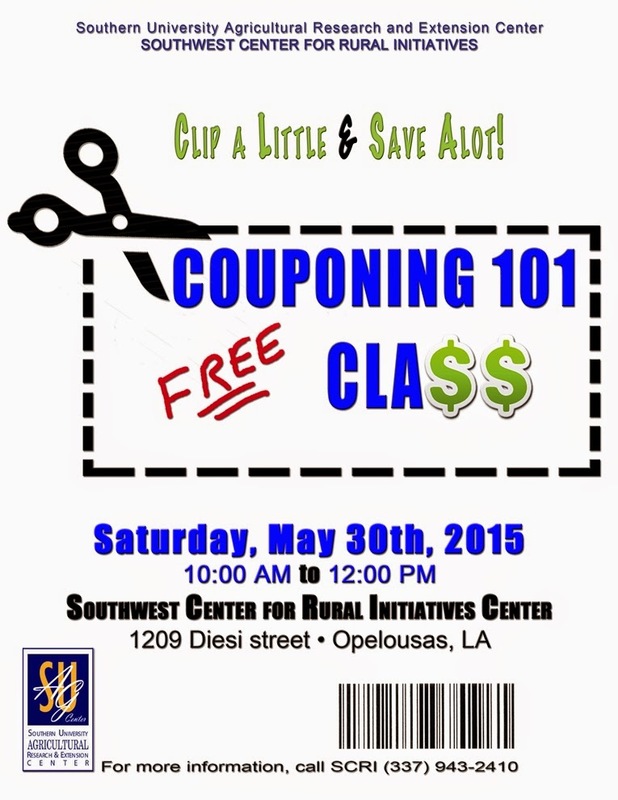 Baton Rouge, La – The Southwest Center for Rural Initiatives, an outreach arm of the Southern University Ag Center, will hold a Couponing Class on Saturday, May 30, 2015 at 1209 Diesi St., Opelousas, LA 70570, from 10 a.m. to 12 p.m. This FREE workshop is entitled, “Couponing 101,” and the first in a series, which will ultimately teach participants the art of “extreme couponing.” Participants will learn how to purchase items at low cost or no cost. All participants are encouraged to bring a friend. In today’s economy, learning how to save money is a very valuable and necessary skill. Couponing can save the average family thousands of dollars annually, and become a catalyst for financial independence. Families can use the money saved from coupons for trips, an emergency fund, savings account, home repairs, etc. For questions or comments, please contact Krystle Washington at (337) 943-2410. Baton Rouge, La. 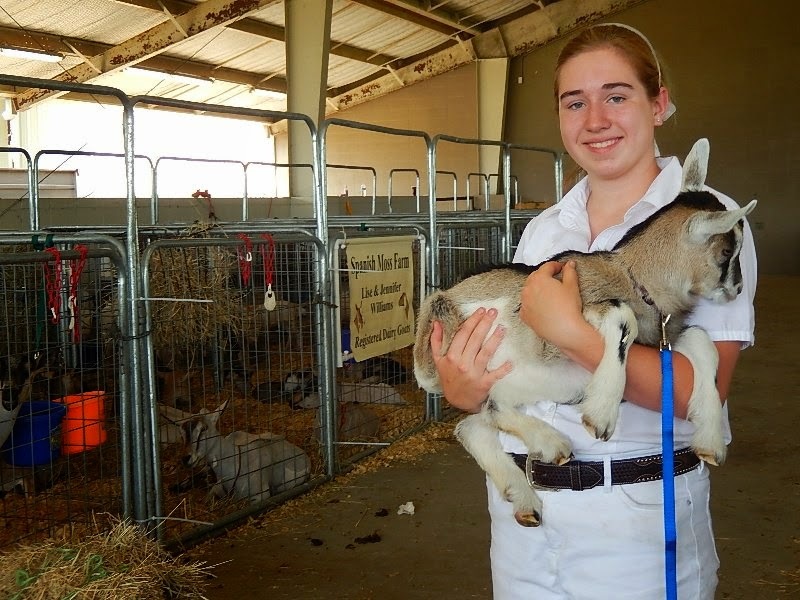 - The SU Ag Center will hold its 2015 Family and Youth Exposition from June 18-20 in Baton Rouge. This year’s theme is “Dream: Discover the Rewards of Educating & Advancing Minds.” The public speaking and illustrated talk competitions will be held on Friday, June 19 from 9:00 a.m. - Noon in the Smith –Brown Memorial Union on the Southern University campus. The guidelines and registration forms for the Public Speaking and Illustrated Talk Competitions are available online. You can either visit the SU Ag Center website and look at the June Events or click on this link to access and download the PDF files. Extension agents are advised that registration forms can be completed electronically and forwarded via email to dawn_mellion@suagcenter.com or faxed to 225-771-2861. For further detail, contact Dr. Dawn Mellion-Patin via email or telephone at 225-771-3532. 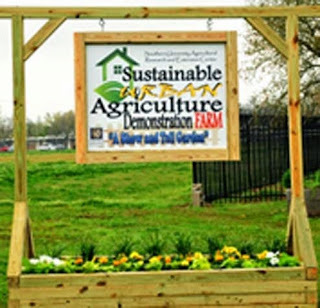 Baton Rouge, LA- The Southern University and LSU Ag Center’s will co-host a Louisiana Sustainable Agriculture Research and Education (SARE) Baton Rouge Area Farm Tour from noon to 5 p.m. on Sunday, May 17. The one day tour is being held to serve as an outreach activity for local sustainable farmers. Participants must provide their own transportation and drive themselves with a map to the participating farms. The tour will begin with Luckett Farm, followed by Louisiana Pride, then Yardbird Farms and end at the McKowen Farm. After the tour, McKowen Farm and Slow Food Baton Rouge will sponsor a picnic featuring food from the farms visited during the tour. Individuals interested in attending the event are encouraged to donate $5 per person, bring their own libations, side dish items and a blanket. SARE is a professional development program sponsored by the Southern University and LSU Ag Centers. The centers work together to implement programs that enhance the capabilities of Louisiana's Ag professionals through research and the implementation of science-based practices. The program’s educational initiatives include workshops, long-distance education training sessions, field trips, resource manuals and informational bulletins. For more information about the tour or to volunteer, please contact Ann Savage at asavage@agcenter.lsu.edu or Anna Claire Ferchaud at aferch3@tigers.lsu.edu. Baton Rouge, La. – The Southern University Board of Supervisors has named Dr. Adell Brown Jr., as Interim Chancellor for the SU Ag Center effective July 1, 2015. 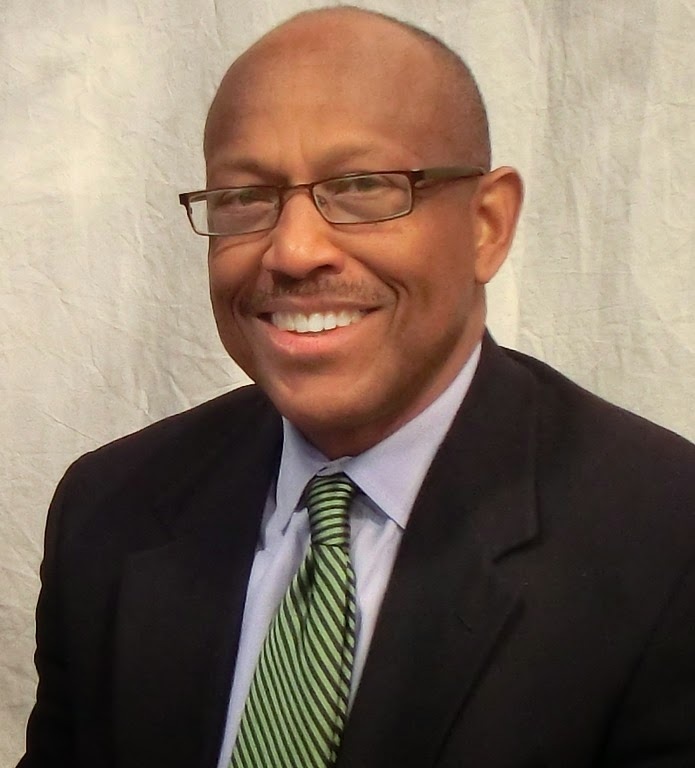 Prior to now, Brown served as Vice Chancellor for Finance and Administration, and currently as Vice Chancellor for Research and Executive Vice-Chancellor. Brown has over 42 years of experience in higher education and agriculture, with 39 of those years at Southern University. 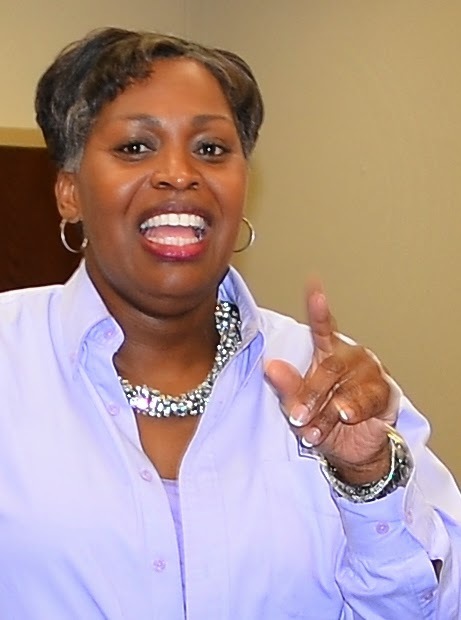 Brown earned a Bachelor of Science in Agricultural Business from Northeast Louisiana University, a Master of Business Administration with a concentration in Management and Finance from the University of Southwest Louisiana and a Doctorate in Agricultural Economics with concentrations in Production Economics, Statistics and Management from Louisiana State University. Baton Rouge, La. 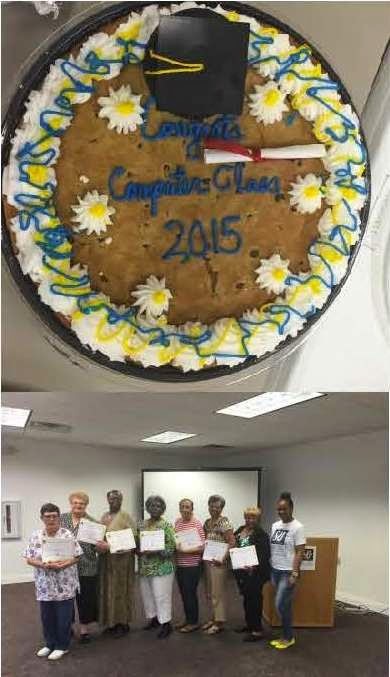 - Having fun and learning about computers can all happen at once, and the Southwest Center for Rural Initiatives (SCRI) wrapped up its eight-week Spring Computer Training Program for adults on Wednesday, May 11, 2015. This class was targeted for adults 55+ from the community of St. Landry Parish and collaboration with Experience Works group on teaching topics that range from a basic Introduction to Computer, Microsoft Office, to Internet use. This mission of this program was to provide adults hands-on experience and education on computer technologies to enhance their lives and enable them to share their knowledge and wisdom. The computer training program helped participants build their confidence when using computers in the library, at home, at work, or when looking for a job. There were 10 students who took advantage of these free classes and received certificates of completion for participating in this program. The computer class was well received by participants, and many are looking forward to the next computer session. 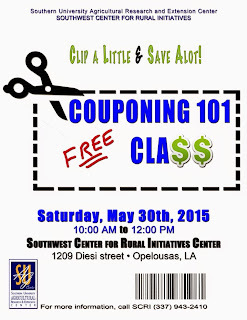 This is one of several programs the SCRI offers to improve the socioeconomic well-being of citizens in rural communities within the a ten-parish region of Southwest Louisiana, and we want to continue to provide community programs that will address their scientific, technological, social, economic, and cultural needs. The Southwest Center for Rural Initiatives, located in Opelousas is an outreach arm of the Southern University Ag Center. Baton Rouge, La. 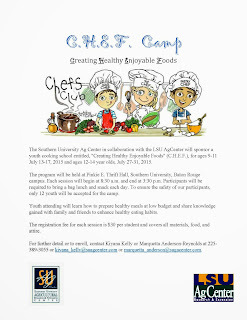 - The Southern University and LSU Ag Centers alongside Sustainable Agriculture Research and Education program (S.A.R.E.) will host Agriculture Day Sustainable Farm Tour at the St. Helena Multi-Purpose Facility at 31676 Hwy in 16 Amite, LA 70422 on June 15, 2015. The event will be held from 8:00 a.m. to 3:00 p.m. and will consist of commercial and consumer horticulture and beef cattle forages farm tours, a program for youth and adults. The tour will comprise of visits to six sustainable farming operations in St. Helena Parish. Baton Rouge, La - On May 7, 2015, St. Helena Sheriffs received plants and materials from Bracy’s Nursery and Hammond Research Station to landscape their flower garden. Ahmad R. Robertson, Louisiana Master Gardner’s Frances Davidson, Betty Curry, and Ollie Fultz, St. Helena College & Career Horticulture Academy Mr. Terry Guy S.H.C.H. Ag Teacher, and St. Helena Parish Trustees architected a beautiful flower and herb garden. 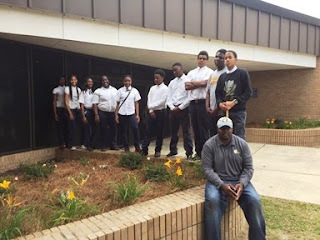 The team planted annuals, and perennials, herbs, roselle hibiscus and Louisiana Super Plants for beautification. The students and trustees learned about planning, preparing soil, spacing, depth, and mulching. The St. Helena Sheriff’s Office and staff will enjoy the colorful landscape created by the SU and LSU Ag Centers. “Increasing the understanding of agriculture is essential to today’s students so that they may become citizens who support wise agricultural policies. The community surrounding your school deserves a beautiful and safe environment, and beautification projects may help encourage students and parents alike to participate actively in your school's social and academic life,” said Robertson. The landscape beautification project is just another example of how closely the local government and local schools work together to create an aesthetically pleasing entry feature the community can be proud of, and a sense of pride and unity amongst local citizens. This project was led by Ahmad R. Robertson Agriculture & Natural Resource Agent St. Helena & Tangipahoa Parish and Sheriff Nathaniel Williams. For more information, contact the St. Helena or Tangipahoa Extension Service at 305 E Oak St., Amite, call (985) 748-5462, (225) 222-4136, or email ahmad_robertson@suagcenter.com or arobertson@agcenter.lsu.edu. Baton Rouge, LA – The Supply Chain Management training which was set for May 14 has been rescheduled for May 21. The date change is due to a scheduling conflict with area high school graduations. The free training, which is being hosted by the Southern University Ag Center, in conjunction with the Economic Development Administration University Center (EDAUC) in the College of Business (COB) at SU’s Baton Rouge campus, will be held at 6 p.m. in the LSU/SU Ag Center, 114 North Cedar Street in Tallulah. Any small business owner who is involved in ordering supplies or merchandise from a manufacturer, wholesaler or retailer is encouraged to attend the training. Dr. Jose Noguera, Chair of the Department of Management and Marketing at the SU College of Business, will teach participants how managing their supply chain can reduce costs, increase market share and sales, and build solid customer relations. This is one of several sessions in a series of trainings aimed at boosting the economy of Madison Parish and surrounding areas. For additional information or to pre-register for the training, contact Mrs. Sarah Sims at 318.574.2465 or Dr. Sung No at 225.771.5954. Baton Rouge, La. – Agriculture Secretary Tom Vilsack, recently announced that USDA is making $30 million available nationally to farmers, ranchers and food entrepreneurs to develop new product lines. Funding will be made available through USDA’s Value-Added Producer Grant (VAPG) program. VAPG grants can be used to develop new product lines from raw agricultural products or additional uses for already developed product lines. Military veterans, socially disadvantaged, and beginning farmers and ranchers; operators of small- and medium-sized family farms and ranches; farmer and rancher cooperatives; and applicants that propose mid-tier value chain projects are given special priority in applying for VAPGs. Additional priority is given to group applicants who seek funding for projects that “best contribute” to creating or increasing marketing opportunities for these type of operators. Before you apply: Request a Data Universal Number System (DUNS) number if your organization doesn’t already have one. Register your organization with the System for Award Management (SAM) if you aren’t already registered. Remember, you’ll need your DUNS number to complete your registration. Also, make a note of your CAGE code and expiration date because you’ll need those for your application. Additional requirements: You need to read the Federal Register notice for the details on what is needed for an application. You may also need to fill out required forms. You can get copies of those forms from your nearest Rural Development Office. For questions in Louisiana, visit http://www.rd.usda.gov/la or the State Office at 3727 Government Street, Alexandria, LA 71302 or call 318-473-7920 | 844-325-6950. Baton Rouge, La – The Southern University Ag Center welcomed Tim Sheehan on May 12, 2015 for a brief tour and presentation. Mr. Sheehan, Senior Program Manager of the Borlaug Fellowship Programs was visiting from the United States Department of Agriculture, Foreign Agricultural Service, Office of Capacity Building and Development, Trade and Scientific Exchanges Division to share information on the Norman E. Borlaug International Agricultural Science and Technology Fellowship Program. Following his presentation to a handful of administrators, faculty and staff of the SU Ag Center and SUBR, Sheehan was led on a tour of the Center's research labs and facility. The program is named after Dr. Norman E. Borlaug, Father of the Green Revolution. It helps developing and middle-income countries strengthen sustainable agricultural practices by providing scientific training and collaborative research opportunities for mid-career researchers, policymakers, and university faculty. The program matches participants with experts in their field at U.S. host institutions. 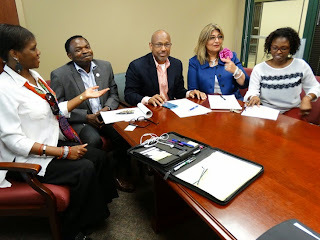 The program objectives are to build relationships to advance agricultural trade and capacity building through scientific exchanges and to help developing nations strengthen agricultural practices by providing scientific training and collaborative research. 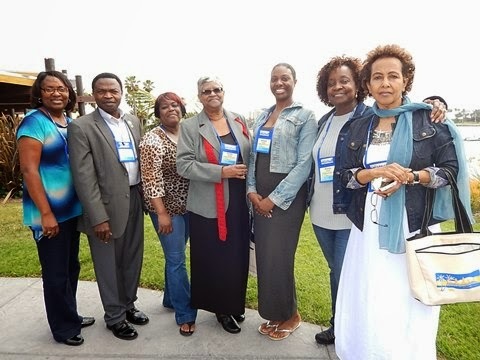 Baton Rouge, LA - The SU Ag Center was well represented at the National Extension and Research Administrative Officers Conference (NERAOC) held May 3-7, 2015 in San Diego, California. 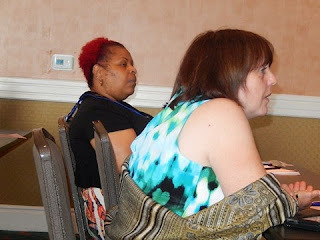 The conference was attended by more than 500 participants targeting administrative staff across the United States, its territories and the Islanders who work in areas such as evaluation, finance, grants, human resources, etc. This annual conference brings the officers of the United States Department of Agriculture/National Institute of Agriculture (USDA/NIFA) to the same table with Land-Grant institutions (1862, 1890, 1994, HIS, 2008), experiment stations, and territories to discuss important issues affecting agricultural research and extension. The theme of the 2015 conference was “Golden Opportunities.” The United States Congress, after debating for about two years, finally passed the Farm Bill dubbed The Agriculture Act of 2014. This year’s conference included some sessions focused on the Farm Bill, the primary agricultural and food policy tool of the federal government. NERAOC provides an avenue for the USDA/NIFA experts to inform partners about new policies and procedures and how they may impact funding of several programs.